S.T. WILLIAMS. The calcareous operculum as a character for defining subgenera in the marine gastropod genus Turbo. This article provides an overview of the evolution of calcareous opercula and demonstrates their utility in characterizing subgenera in the marine gastropod genus Turbo. Eleven subgenera are now accepted for Turbo and these are discussed, including one new subgenus. The new subgenus is Aspilaturbo (type species Turbo jonathani), with included species T. radiatus and T. marisrubri. Opercular characteristics are shown to be useful for delimiting some, but not all, subgenera. Opercular characters are also useful for species delimitation, particularly in Marmarostoma, which has many species that are otherwise similar in shell size and shape. However, some unusual opercular types have arisen more than once in independent lineages, so caution must be applied before linking species on the basis of such characters alone. Juvenile opercula may also differ from adult opercula, so ideally a growth series is required for complete comparisons between species. Opercula tend to be thicker (more highly domed) in tropical, shallow-water subgenera associated with corals (Marmarostoma, Aspilaturbo and Turbo) reflecting the advantage they offer against crushing predators that are more common in these environments. Opercula from exemplar species from each subgenus are illustrated in colour. A lectotype is designated for Turbo intercostalis Menke, 1843. A replacement name is proposed, Turbo kenwilliamsi nom. nov. for Turbo pulcher Reeve, 1842 (non Dillwyn, 1817). Type species: Turbo jonathani Dekker, Moolenbeek & Dance, 1992, Recent, Oman. new name for Turbo pulcher Reeve, 1842 non Dillwyn, 1817. M. KEPPENS, K. DHONDT & H.K. MIENIS. The variability of the operculum in Nucella lapillus (Gastropoda, Muricidae) from a colony in Audresselles, France. In April 2007 the first two authors investigated the rocky outcrops on the beach of Audresselles, northwest France, for the presence of marine molluscs. Special attention was paid to Nucella lapillus (Linnaeus, 1758) , also known as the Atlantic dog-whelk. A study of the collected material revealed that part of the specimens possessed a strongly reduced operculum, some animals were even completely devoid of an operculum. The aim of this article is to provide some information concerning the variability of the operculum in this population of N. lapillus. K. BANDEL. Operculum shape and construction of some fossil Neritimorpha (Gastropoda) compared to those of modern species of the subclass. 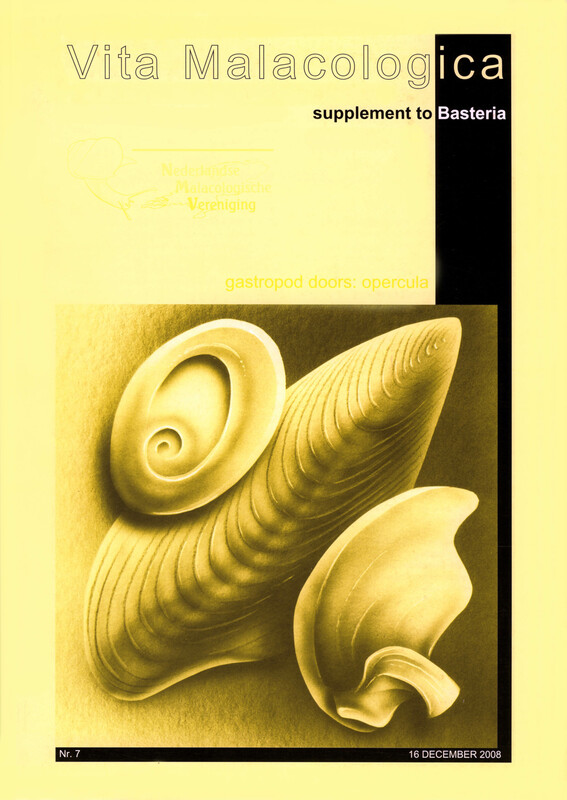 The calcareous operculum of the Neritimorpha is more often preserved in the fossil record than the operculum of most other Gastropoda that is purely organic composition. Together with the morphology of the protoconch and the shell structure, operculum shape represents a useful tool for understanding evolution within the Neritimorpha. The Devonian Nerrhenidae (Nerrhenoidea) have an operculum with spiral construction resembling that of modern Neritoidea during very young stages of growth. The operculum of the modern and Mesozoic Neritopsis resembles that of Triassic relatives of the Cassianopsinae (both Neritopsoidea). The Carboniferous and Permian Naticopsidae (Naticopsoidea) can be connected with species from the Triassic St. Cassian Formation. Hologyra thus resembles Naticopsis. The Triassic Tricolnaticopsidae is distinguished by a quite different operculum. The first Neritoidea are represented by the Triassic Neritariidae and have a similar shape of their operculum, with inner hinge, to that of modern Neritina. A strong decline in diversity of Neritimorpha occurred towards the Jurassic, and Neridomidae fam. nov. (Neritoidea) has an operculum as in Triassic Ruganeritaria. Cretaceous Otostomidae fam. nov. differs in shell shape from Neritidae, while their operculum resembles that of Nerita. The shape of the operculum distinguishes Neritilidae, Neritidae, Smaragdiidae and Septaridae from each other. The Theodoxidae have their lecithotrophic early ontogeny reflected in the simplified construction of their juvenile operculum. Type genus: Neridomus Morris & Lycett, 1851, middle Triassic. Type genus: Otostoma Archiac, 1859, late Cretaceous.